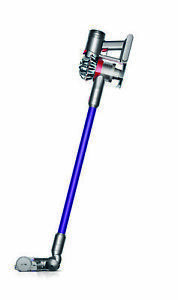 The Dyson V7 Animal is designed for the cleaning demands of pet owners. The powerful direct-drive brush bar head removes animal hair and trodden-in dirt, with a mini motorised tool that applies the same cleaning power to harder-to-reach spaces. Just plug the V7 Animal into its docking station when you're done, as it is cordless. Great product, as described and fast postage. Haven't opened yet, hoping to contact seller if I need assistance please. Item arrived on time as expected, highly recommended ! dyson products and this one in particular, are the best darn products for this use on the market today. i already had a dyson, so this makes two! see how much i love this product!!! the look is modern+ it's lighweight, more accessories than the first one, easy to install, does exactly to the letter what dyson says it does plus more! when my first one croaks, i will definitely buy another one. i cannot be without my dysons, upstairs one and downstairs one.